A thrilling crime debut from a strikingly brave new voice – shades of Patrick deWitt’s Ablutions and Gillian Flynn’s Sharp Objects, set in a vivid and unforgettable Houston, Texas. Twenty-two-year-old Charlotte Ford reconnects with Danielle, her best friend from high school, a few days before Danielle is found bludgeoned to death in a motel room. In the wake of the murder, Charlotte’s life unravels and she descends into the city’s underbelly, where she meets the strippers, pornographers and drug dealers who surrounded Danielle in the years they were estranged. Ginsburg’s Houston is part of a lesser known south, where the urban and rural collide gracelessly. In this shadowy world, culpability and sympathy blur in a debut novel which thrillingly brings its three female protagonists to the fore. Scary, funny and almost unbearably sad, Sunset City is written with rare grace and empathy holding you transfixed, praying for some kind of escape for Charlotte. 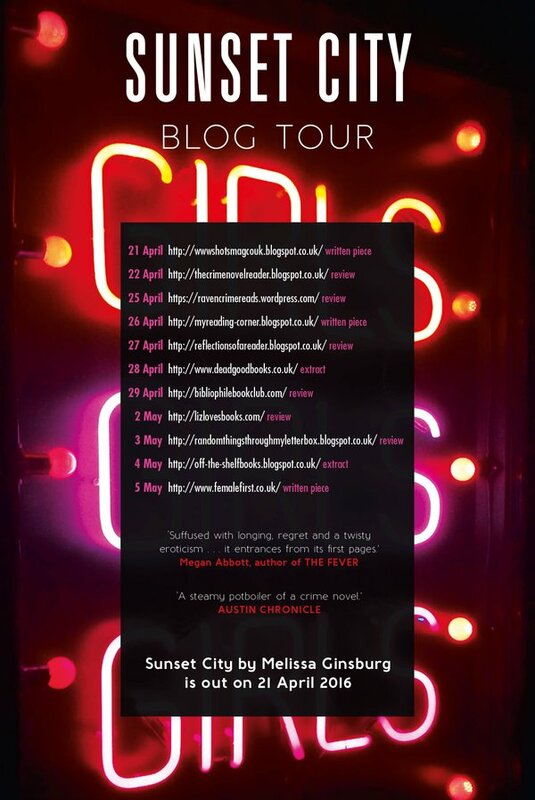 I’m delighted to be taking part in the blog tour for Sunset City and for my turn I have a guest post by the author, Melissa Ginsburg, who has written a piece on the relationship between the two central characters, Charlotte and Danielle. Who are Charlotte and Danielle? 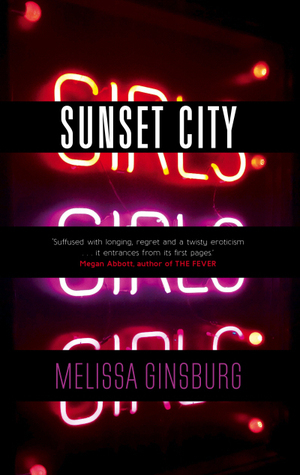 The friendship between Charlotte Ford and Danielle Reeves forms the heart of Sunset City. Their relationship has not been easy, and when the book begins, they have been estranged from one another for several years. Charlotte is 24, working as a barista at a local café and living in the small apartment she grew up in. She’s been alone there since her mother died when Charlotte was 18. Danielle Reeves, Charlotte’s best friend from high school, has been the single most important person in Charlotte’s life, even though they’ve been out of touch. When they were 15 years old, they fed into each other’s needs perfectly. Danielle was charismatic, beautiful, and impulsive. She could afford to be reckless, because she came from a wealthy home and no one depended on her. That felt exciting to Charlotte, who was the caretaker for her sick mother since she was a child, and always had to be very grounded and responsible. Charlotte was an adoring audience for Danielle, and Danielle was attracted to Charlotte’s stability. When Charlotte’s mother dies, Danielle is given the opportunity to be kind and generous, to be needed by someone. She steps into that role beautifully, and learns that she is capable of being a really wonderful friend. But Charlotte’s mother’s death is also the catalyst for Danielle’s drug addiction. The girls start taking the dead woman’s leftover prescriptions of Xanax and painkillers. When the drugs run out, Danielle switches to heroin. Charlotte is unable to help Danielle, though she feels responsible for exposing Danielle to drugs. Charlotte’s guilt adds fuel to her already fierce loyalty. They helped each other and they hurt each other, because neither of them was equipped to deal with the circumstances of their lives. Danielle is murdered a few days after the two friends meet. Charlotte feels completely unmoored without Danielle, and she goes a little nuts. I wanted Danielle’s death to devastate everyone she knew, because of the loss and because of the difficulty inherent in loving her. That difficulty doesn’t go away when somebody dies. I’m interested in that complexity, in writing and in life. Grief is not just about sadness or longing. It’s also about regret, and the realization that the distance you always hoped to bridge will never be overcome, mistakes can’t be undone. To me, that part of it is more heartbreaking than just missing someone. Complicated, difficult people are interesting to write about, and to be around. Charlotte and Danielle have this very intense relationship. They care deeply about each other, but they are also both trying their best to take care of themselves and move forward, which conflicts with that loyalty. I wanted to explore a relationship that was intense, full of love and loyalty, but also untenable. There’s built in drama there, a doomed quality, that seems to fit with who these characters are. 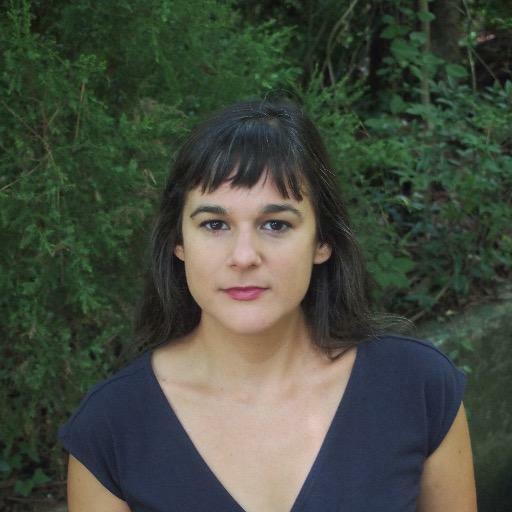 Melissa Ginsburg was born and raised in Houston and attended the Iowa Writers’ Workshop. She is the author of the poetry collection Dear Weather Ghost and two poetry chapbooks, Arbor and Double Blind. She teaches creative writing and literature at the University of Mississippi. Sunset City is her first novel.